The second, more advanced book on medical astrology from Dr. Charak. In this book: Use of multiple dashas (Vimshottari, Yogini, Chara) to confirm the same event; use of divisional charts & transits for medical astrology; the role of retrograde planets in causing disease; malefic conjunctions leading to ill health; adverse role of Trika houses & their lords; the dreaded 22nd drekkana & the 64th navamsha; the use of the lesser-known, but definitely adverse Mrityu Bhaga; applications of standard astrological dicta & their numerous modifications as determined by actual horoscopes, more. 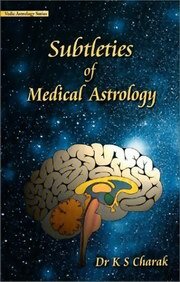 The Subtleties of Medical Astrology is the second, and more advanced, work on medical astrology by the author who is both an astrologer and a surgeon. His earlier work titled Essentials of Medical Astrology has earned wide acclaim all over the world. The present work, now in its second edition, consists of his further research into more subtle areas of medical astrology. • A highly scientific approach toward analysis of horoscopic charts for purposes of medical astrology. • Use of multiple dashas (Vimshottari, Yogini, and Chara) to confirm the same event. • Use of divisional charts as well as transits as applicable to charts for medical astrology. • Varied aspects of the role of retrograde planets in causing disease. • Malefic conjunctions leading to ill health. • The adverse role of the Trika houses and their lords. • The dreaded twenty-second Drekkana and the sixty-fourth Navamsha. • The use of a lesser known, but definitely adverse, area called the Mrityu Bhaga. • Application of the standard astrological dicta, and their numerous modifications as applicable to actual horoscopic charts. • Rich astro-medical data which has been used to profusely illustrate the book. Dr KS Charak is Head of the Department of Surgery at the Indira Gandhi ESI Hospital, Delhi, India. Author of some of the best appreciated books on Vedic Astrology, he is also the Honorary Editor of the bi-monthly magazine Vedic Astrology.